What happened to Sasquatch Man of Kings Pond Park? On a sunny afternoon in August, I was on my way to an appointment and chanced to coast up Northeast 54th Avenue. My eye was drawn to the blue-and-white "Future Neighborhood Park" placard in a field. Then I noticed the towering apelike creature prowling across the veggie patch. No mistake: It was Sasquatch. Naturally, I parked and went over to say hi. Bigfoot didn't say much, though, because he was made of thick plywood. He towered over me but didn't make a threatening move. Stuck to his back was a weathered business card that said "Larry Lund, the Sasquatch Sleuth." The phone number wasn't legible. There was nobody home at the house alongside the little empty garden. I snapped a couple of pictures and went on my way. It was your typical chance meeting between reporter and myth, and I frankly forgot all about it. Until, that is, I started hearing that Sasquatch had prowled right off the landscape. Parks planner Stephen Duh said Sasquatch went away along with the renter who'd been there since long before Parks and Recreation bought the land. Man and myth were evicted because Kings Pond Park is one of those lucky parcels that'll change from open field to neighborhood playground thanks to the metro parks ballot measure that passed this year. With construction set for for 2007 and planning soon to get under way, Duh said, the city wants the house gone. That'll probably happen this winter. But here's where things started getting weird. I checked The Columbian's electronic archive for clues about a Sasquatch Sleuth named Larry Lund, and found more than I'd bargained for. Lund had indeed appeared as a Bigfoot investigator on television and before many groups and conferences focused on the elusive creature. Even more surprising to me was that Lund had died in August 2000, at age 66. Yet neighbors told me the fellow who'd vanished with his Sasquatch was definitely Larry Lund. Former next-door neighbor Jeanette Dunkin sang Lund's praises as the friendliest, nicest guy you'd ever want to meet but was not noted for truth-telling and added that he'd had a hard time finding a new place to take his humongous collection of Bigfoot materials and paraphernalia; some say a collection of junk and memories important only to him. All while being dead? Impressive. And a little creepy. Mindful of the fact that Sasquatch is generally thought to have been debunked a few years back and that nary a Lund has been mentioned in our newspaper since I began to ponder this ghostly Lund figure following ghostly Bigfoot off into the ghostly afterworld. Larry lives! 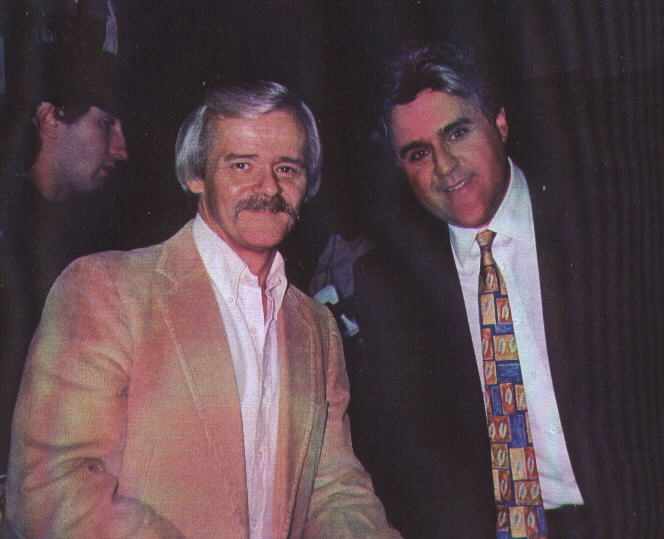 (Photo shows Lund on the left with Jay Leno on the "Tonight Show; his only real claim to fame." Well, the answer is obvious enough: The gentleman who died in 2000 was a different Larry Lund. He was owner of the Igloo restaurant on East Evergreen Boulevard from 1991 until his death. He lived in Washougal. Meanwhile, the Sasquatch Sleuth, alive and kicking at age 58, has moved to Stockford Village that's northwest Hazel Dell, you might say, tucked between Sacajawea Elementary School and Northeast 99th Street. This Larry Lund said he once was used to being mistaken for the other Larry Lund who was a good friend of his brother's although it hasn't happened in a while. He was able to brush up on reassuring people that he's still alive by reassuring me. He said he hated to leave his green spread in East Minnehaha after 15 years, and that his plywood Sasquatch now lives in his new backyard alas, no longer on public view. Most amazingly, Lund said he's still on the fence about the real Sasquatch. He's spent close to 40 years investigating claims and studying evidence, much of which doesn't impress him. A friend of his, Rene Dahinden claims Lund never really studied anything and his investigations were not scientific. "Lund," said Dahinden, "was really a nice guy but not very bright." "We have Bigfoot sightings that go back as far as 1811," he said. "There are Indian legends and all kinds of sightings from before Ray Wallace's time." So the mystery endures. For some, anyway. But for now let's file away the case of the Disappearing Sasquatch Man of Kings Pond Park.